Veterans’ benefits are not limited to health care, home loans, education and professional development. Veterans’ benefits also include access to set-aside and sole source contracts for Service-Disabled Veteran-Owned Small Businesses (SDVOSBs) and Veteran-Owned Small Businesses (VOSBs) with VA.
VA’s Office of Small and Disadvantaged Business Utilization (OSDBU) works closely with key procurement stakeholders to ensure that Veteran-owned businesses have opportunities to be awarded contracts. In fiscal year 2015, SDVOSBs were awarded 17.9 percent and VOSBs were awarded 19.7 percent of VA’s total contracts—totaling more than $7 billion. “VA OSDBU works to make a difference one Veteran at a time by facilitating their rightful access to set-aside and sole source contracts,” said Chanel Bankston-Carter, director for VA OSDBU strategic outreach. VA OSDBU operates through the following four key areas: direct access, verification, strategic outreach, and acquisition support. The Direct Access Program (DAP) allows the Veteran business owner and procurement decision maker (PDM) to meet face-to-face—allowing a more personal conversation to discuss the buyer’s requirements and supplier’s capabilities. DAP hosts events which offer unique opportunities for VOSBs to build partnerships, maximize networking, gain access to PDMs, and directly market products and services. DAP events also help PDMs access procurement-ready Veteran-owned businesses, conduct market research, and assist VA in meetings its small business goals. “DAP events contribute to Veteran business success within the federal marketplace by giving these businesses the opportunities to showcase their capabilities directly to federal and commercial procurement decision makers,” said Thomas J. Leney, executive director for VA small and Veteran business programs. DAP also hosts the secretary’s annual event — the National Veterans Small Business Engagement (NVSBE), the largest procurement gathering for the Veteran small business community. NVSBE places the spotlight on America’s Veteran-owned businesses by promoting their access to federal and private procurement opportunities. At NVSBE, VOSBs engage to build potentially lucrative relationships, learn about federal contracts specific to their industries, discover prime and subcontracting opportunities, demonstrate their capabilities and market their businesses. The 2015 NVSBE attracted more than 3,000 attendees who connected with nearly 400 federal and commercial PDMs. “Few events for Veteran business owners will get you this close to decision makers,” said Jack Coley of Coley Solutions, a VA-verified SDVOSB in San Antonio, Texas. The 2016 NVSBE will be held Nov. 1–3, in Minneapolis, Minnesota and is expected to exceed last year’s success. To compete in the federal marketplace, VOSBs must be procurement ready—meaning they are able to demonstrate their ability to meet the requirements necessary to compete for VA and other federal contracting opportunities. To work with VA as a small business contractor, it’s mandatory that VOSBs also be verified with VA.
Verification, a prerequisite for participation in the Veterans First Contracting Program, ensures that small businesses are legitimately-owned and controlled by Veterans to compete for SDVOSB and VOSB set-asides. VA is the only federal agency that verifies VOSBs as a requirement for competing for Veteran set-aside procurement opportunities. VA OSDBU’s Verification and Evaluation Program reviews and processes verification applications of Veteran business owners to ensure they meet three core tenets—eligibility, ownership, and control—in accordance with regulations. Veteran business owners begin the verification process by registering within VA OSDBU’s online database, Vendor Information Pages/VIP—and working with an application case manager for prequalification consultation. The strategic outreach program provides education, training and communication to Veteran-owned and other small businesses. It ensures that Veteran-owned and other small businesses have access to programs and services that may contribute to their increased participation in the federal marketplace. The Doing business with VA and procurement readiness reference guides and webinars are the most popular information resources that outline the VA OSDBU framework for success, with insight and training on writing capability statements, responding to RFIs, applying for VA verification, preparing for success at DAP events and more. “We want to meet Veteran businesses where they are and give them the necessary tools to ensure that—when VA identifies a need—these businesses are aware and can have a seat at the table to show that they are capable of fulfilling that need,” added Bankston-Carter. Acquisition Support ensures that VOSBs receive equal access to all VA procurements. It helps VA acquisition professionals, particularly those looking to do business with SDVOSBs and VOSBs, by gathering market research that ensures that maximum opportunities are granted to Veterans and provisions related to small business programs are met. 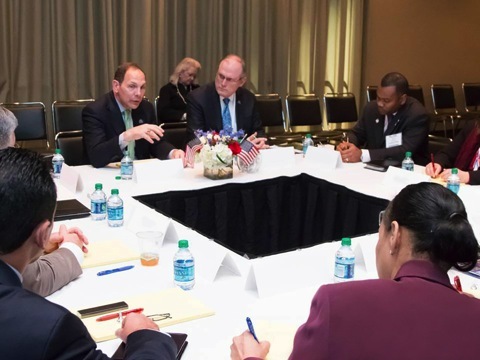 Aligning with the MyVA Transformation, an effort that Secretary Bob McDonald has implemented to provide Veterans with a seamless, integrated, and responsive customer service experience, VA OSDBU helps Veteran business owners become procurement ready to do business by giving them access to PDMs with procurement needs. VA OSDBU is committed to improving its service to Veteran-owned and other small businesses—and working with program and contracting staff to meet VA small business goals and provide opportunities for VOSBs to work with VA and other federal agencies. Kathleen E. Wilson works with the VA Office of Small and Disadvantaged Business Utilization. She serves as communications team lead offering integrated marketing communications management of VA OSDBU campaign planning, graphics design, messaging, social media and website development. Kathleen is a native Washingtonian who loves to travel and visit museums.